Few of the Super Robot Wars games have had a continued and concise narrative arc. Starting in 2000, the Alpha trilogy took five years to run its course. With the finale being nothing short of epic, as it had one of the largest ever series rosters at the time (a whopping 33 series in total) and contained the most potent of all super robots; Ideon. That wasn’t all either, Alpha 3 was the first Super Robot Wars game to feature mecha from another gaming franchise. With the mighty virtuaroids from Virtual On Oratorio Tangram and Virtual On Marz present in the game, the overall mix was a very interesting and most definitely a diverse one. All that aside, Alpha 3 remains to this day as one of the greatest Super Robot Wars ever made. Much of the functional core seen in most Super Robot Wars games is very much present in Alpha 3. 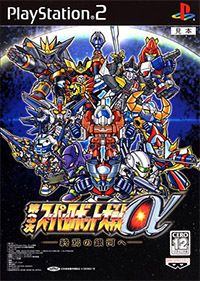 Remaining resolutely a turn based strategy game, the player sets up groups of mecha, each with diverse attacks and a variety of pilot abilities. The groups setup doesn’t control a formation but it allows support units and lower ranking units to assist the big hitters. You can also choose to have the subordinate group units to take a hit for the team so to speak, as well as do cumulative attacks of their own. Groups naturally have a unit cap, with some units reaching this ceiling quicker on account of their greater potency. Mecha can also be upgraded, from their defense and energy resources to their attacks as well. Pilots are also similarly upgradeable, as skills can be purchased not to mention base upgrades to their respective attributes. Mecha can also have parts equipped that do a variety of things; from boosting their range to increasing their armor further. Managing all these aspects is still as crucial as ever and making sure that units don’t get left behind is very important. Normally in Super Robot Wars games, the AI tends to ignore the weaker units and just attack whatever is closest. In Alpha 3, the enemy purposefully seeks out the weaker units. This has two results; the first is that the big hitters that you’ve upgraded to the hilt get ignored (meaning no easy kills) and the second is that you’ll likely lose the weaker unit resulting in a cash penalty at the end of the mission. In addition, if you want the good ending you need to pretty much get all the secret conditions across the missions as well as keeping your turn count low. This means the simple act of having the AI seek out your weaker units means that you have to plan ahead more as well as balance out your upgrades more carefully, rather than rely on a few powerful units. To make matters more intricate, the enemies are far more specialised across the game. This means that you will face very potent and well armored enemies, followed by very agile units. So one strategy won’t work all the time. In short, there is no straight forward and simple way to brute force your way through Alpha 3. Well, that is until Ideon turns up. Ideon isn’t the only game changer either, as Basara from Macross 7 is a phenomenally useful unit too. Especially as he can not only boost morale on friendly units as well as increase their seishin points. The former is very useful on mecha like Dancouga, whose most powerful attacks don’t unlock until it reaches a high level of morale. Plus the seishin are even more important in Alpha 3, so having effectively a free points boost is very helpful indeed. What is most striking about Alpha 3 though, is that whilst many of the series are new there are an awful lot of older super robots present. The whole roster ends up feeling very classic somehow and a little bit retro too. Having these older classic mecha high five with the Evas and VRs makes for some interesting tactical choices. It’s fair to say that Alpha 3 isn’t the most technical of the Super Robot Wars games but it is by no means a simple walkover either. Getting the most out of Ideon means you’ll be perilously close to losing the unit and you can’t use the same tactics on all the enemies as their attributes are more specialised. Energy consumption on the bigger mecha, especially the likes of Dancouga, also mean you can’t have them take on waves of enemies indefinitely. In summation, Alpha 3 struck a rare balance between strategical restriction and overt potency. Something that made the latter all the more captivating on account of the former. Managing to get the likes of Ideon to max out its Ide Gauge and into a position where it could unleash its map attack remains hugely satisfying. Not to mention the cornucopia of other wonderful mecha to choose from, makes Alpha 3 one of our favourite Super Robot Wars games. As such it comes thoroughly recommended. Now if the good folks at Sony would release the PS2 generation SRW games on the network and make them Vita friendly . For now I can always enjoy my SRW Alpha on goood’ol PSP. How do you guys play these games? I’ve only played OG and OG2 on the Game Boy Advance and I’ve only heard of Alpha and J being released with English language patches via torrent. We play original Japanese versions on either our Japanese PS2 or 60GB Japanese launch PS3 (that still has backwards compatibility with PS2 games). I learned how to play the games quite strategically by learning tiny bits of relevant kanji game by game over a number of years. As for the story, I watch a ton, and I mean a TON of the series involved in most of the SRW games I play. Heck, were it not for SRW and ACE, I wouldn’t have seen Zeorymer, GEAR Fighter Dendoh, L.Gaim, Dragonar, Dancouga, or Aquarion (and only one of those shows is awful and boring in my opinion). Also, an imported PS2 is great to have. I’ve also discovered so many shows by playing these games. There are also some that i didnt like prior to their appearance (for example Gundam 00 until Z2) but actually went back and watched again, gaining more of an appreciation for them. my biggest shame however is that ever since playing alpha 3 I’ve wanted to see Dancouga but have never found copies of it anywhere. I play mine on the PSP or PS3 using a Japn PSN account to access the Japan PSN store. It’s not cheap so Ive only bought one ,SRW Alpha , but it’s a great game .